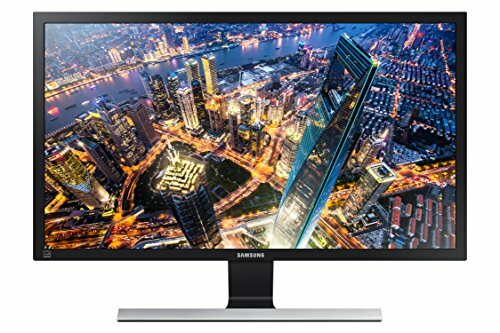 Samsung UE590 28" UHD-QHD LED Monitor: Comfortable and Immersive Viewing Experience, Easy on the Eyes with Flicker Free and Eye Saver Mode, Optimized Entertainment Experience, Energy Efficient. With stunning Ultra HD picture quality, PC viewing, gaming and more come alive with incredible lifelike detail. AMD FreeSync and 4ms response time minimizes input latency and dramatically reduces image tearing and stutter during gaming. An incredible 1 billion colors delivers detailed, natural looking, and extremely realistic images; Power Supply: AC 100-240 V. Watch your favorite movie or video in one window while simultaneously working on a spreadsheet with Picture-in-Picture (PIP) 2.0 technology. Connect multiple Ultra HD devices, like PCs and gaming consoles via two HDMI 2.0 inputs as well as one Display Port input. Discover Realistic UHD Picture Quality. AMD FreeSync with 1ms Response.